I first saw the concept of iterative design discussed in the book Invent to Learn by Gary Stager and Sylvia Libow Martinez. It didn't really sink in though until I was learning more about Minecraft and chatting with Minecraft experts on a MinecraftEDU Twitter chat. 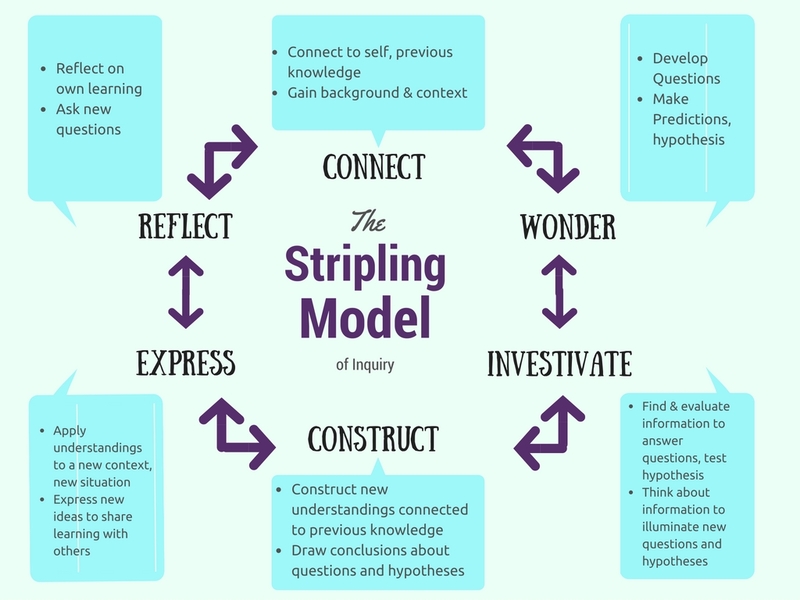 The more I discovered about the concept, the more I realized it was exactly what I was missing in my makerspace project development. For me, iterative design, or design thinking, helped to bring an element of mindfulness to creation. It also helped to establish an expectation that our work can always evolve, and through that evolution we continue to grow as learners. 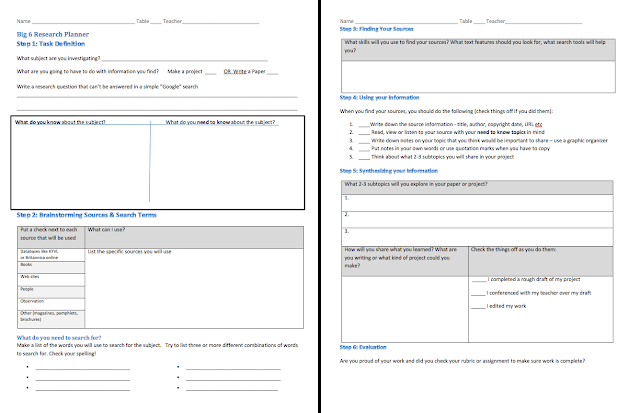 To help students think through the design process, I created an interactive notebook that coaches them through three iterations of a project. The tool can be used for physical models, multimedia projects or even live demonstrations. Check out the interactive notebook to see how the process works. This post originally appeared on the FTISEdtech blog as an introduction to new makerspace materials available for teachers. This post originally appeared on Learning in Progress October 12, 2016 and was for a workshop. To see the lesson on Blendspace click [here]. You can find resources for the Big 6 research process including planner, expectations charts, notes sheets and rubrics in The Big 6 Folder. 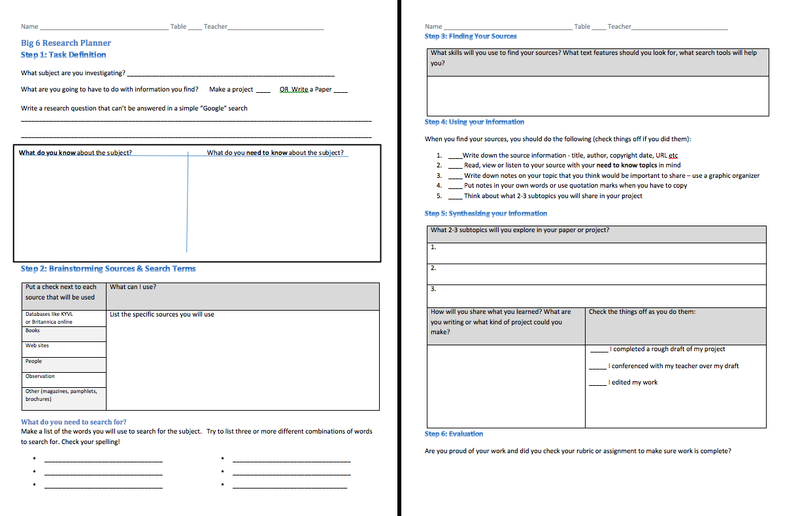 Project Based Learning specific handouts including a PBL planner and Super 3 organizer can be found in this Handouts folder. 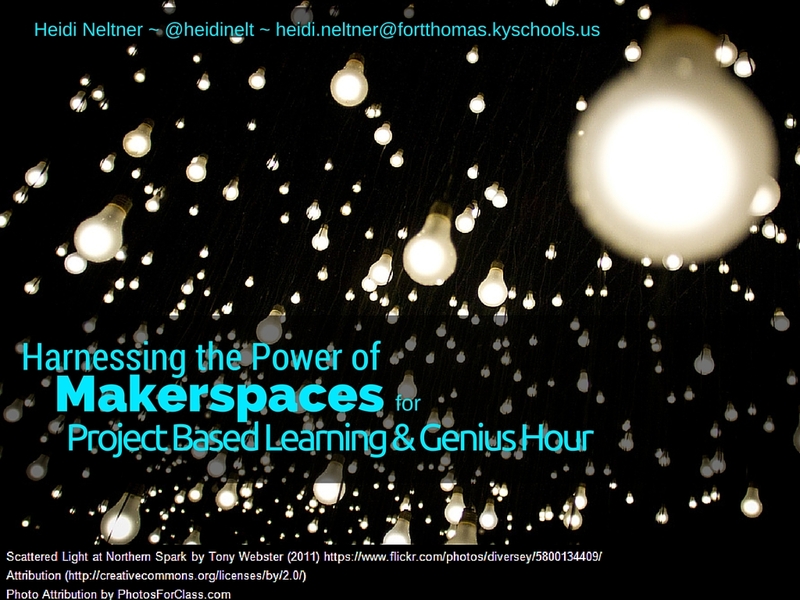 See more about Genius Hour here including a Blendspace that walks students through the process. 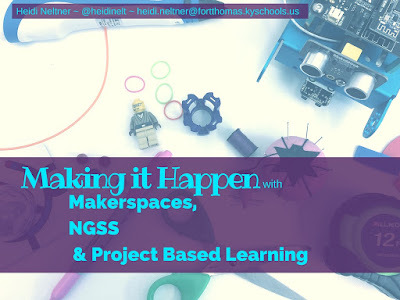 Makerspaces are an incredible way to connect to student interests, improve student choice and voice and possibly introduce them to a skill that they will use in a future career. Here is the presentation from the 2016 Persistence to Graduation Summit, held in Lexington, KY. Participants engaged in a maker activity and discussion surrounding makerspaces. Hover over the Thinglinked image below and "hotspotted" resources will appear that you will be able to click on. You can also view the image on Thinglink. At the end of the 2014-2015 school year, one of our Spanish teachers approached me with an idea. Her primary grade Spanish classes were studying migration patterns of Monarch butterflies as a way to make connections between our region and different Spanish speaking countries in Central America, and she wanted to try to create a garden that would help promote the survival of the species. The idea seemed like a great way for the two of us to collaborate, and it turned out that her timing could not have been perfect. The very next week, local businesses were giving away seed packets that contained milkweed, the plant that the Monarch butterfly caterpillars need for food. We each picked up some seed packets and began working out plans. I began the 2015-2016 year with an email newsletter to our parents explaining that one of the goals for the year would be to work with students to build the garden, and within a few minutes, one of our parents responded to the newsletter with information about a way we could actually make it happen with help from the University of Kentucky Campbell County Extension Cooperative. We reached out to DJ Scully at the Cooperative, and within a few meetings we had a good plan for where the garden would fit and how we might fund it through the writing of a grant. We were so fortunate to have been awarded the grant within just a few short months! We looked for ways to try to encourage full school participation in the project, but the best scenario turned out to be to have fourth graders use the project as inspiration for one of their project based learning options, while our Spanish teacher covered migration patterns and life cycle with the primary aged students. For this particular project, I challenged students to learn about how to build a raised bed garden, identify the materials we would need within the budget of the grant that we were awarded and learn about what we would need to do to create a habitat for Monarch butterflies to survive. NGSS - 3-5-ETS1-1 Define a simple design problem reflecting a need or a want that includes specified criteria for success and constraints on materials, time or cost. NGSS - 3-5 ETS 1-2 Generate and compare multiple possible solutions to a problem based on how well each is likely to meet the criteria and constraints of the problem. NGSS - 3-5- ETS1-3 Plan and carry out fair tests in which variables are controlled and failure points are considered to identify aspects of a model or prototype that can be improved. CCSS W.4.7 Conduct short research projects that build knowledge through investigation of different aspects of a topic. How do you build a raised bed garden, what materials do you need and how can we protect the environment from deer? How do you build a raised bed garden and how do you create an environment that will be safe for monarch butterflies to survive? How do you build a raised bed garden and how will we attract butterflies to the garden? For the extended inquiry, we received some of the resources we would need from Mr. Scully. The kids all watched two videos about raised bed gardening and read some information about creating the right environment. The kids also took notes over their individual focus questions regarding deer and habitat. We use the Big6 model of research, and the kids all have a standard set of graphic organizers they use through the process. For the kids in the butterfly group - with these resources to start them off, they really demonstrated a great deal of success. Through conversations with students, I found them really going deep with their topics. On their own they were researching materials and cost on websites like Home Depot and Lowes, they were calculating the amount of dirt needed using area and perimeter of the proposed bed sizes and bag size, and they were passionately discussing things like composting, deer control, organic gardening, water collection and flower bed arrangement. The kids in the butterfly garden groups took the lead of students researching aquaponics and asked me to create a Padlet for them to post ideas and share resources across classes. Throughout the inquiry process, the kids demonstrated a great deal of focus and ownership. In their research they found many ways they would like to extend the original scope of the project, and I think in the future the entire school community will find many ways to expand the project. Once students were finished with their research we were able to purchase the materials needed to build the raised bed garden, with input from our local expert, Mr. Scully. On one morning we were able to have the kids work in small groups to build the beds. All wood was precut, so all the kids had to do was assemble. Mr. Scully gave the kids directions for how to assemble the beds and use the power tools and then we were able to turn the kids loose. Groups took turns using the power tools, and documenting the steps using note taking strategies, photos and videos. Once the beds were built, students followed directions to prepare milkweed seeds for planting. We had to refrigerate the seed and wait about 30 days to plant the milkweed so that gave us time to get dirt delivered and the beds into the ground. In all, this year we built 4 raised beds. We planted milkweed and plants to attract butterflies in two of the beds and the other two beds we plan to use for rotating different types of vegetables and flowers. The milkweed went in a little late in the season, so we're concerned it did not actually germinate. If that is the case, we will try again in the fall. It is my sincere hope that the raised bed garden is the beginning of many learning opportunities. Students have already mentioned wanting to try composting and organic vegetable gardening as well as building additional beds and creating a system to collect water in rain barrels. The garden has the potential to inspire many different grade levels with future project based learning, and will hopefully become a great habitat for Monarchs. This learning experience was very successful for all groups involved. I think it really helped having an expert to consult through the entire process. Students are really invested in the success of the garden and have plans to talk with teachers about collaborating further to expand. In fact, without my knowing it, a small group of students hosted a bake sale and lemonade stand during a community garage sale and raised almost $200 to donate to the garden cause. We were able to use that money to buy some fencing as a way to deter deer. I believe the raised bed gardens alone will provide the school community with ongoing learning experiences. I know that we may not be successful this year in creating the right habitat for preserving Monarch butterflies, but over the next few years it is something that we can work towards. For makerspace inspired Project Based Learning work this year in the library, fourth graders were given a choice of projects to work with. One of the choices was to learn about aquaponics. I first became interested in using the library as a place to spark interest in growing things after I read the School Library Journal article "Dig it! Library Gardens Sprout Up Coast to Coast" from August 2014. I was completely amazed by the system set up by the Cranbury School in New Jersey and felt inspired to bring a more hands on sort of learning experience to my own students. could be a manageable task for elementary students. Students were challenged to learn about aquaponics, figure out how to put an aquaponics system together and create a project that would teach others about aquaponics. What is aquaponics, and what do we need to do to put the kit together and create a working system? What is aquaponics and how can we create our own, unique system using a 55 gallon fish tank? For the groups researching the second question, they had to provide me with a list of the materials we were going to need to make a larger system so that I could write a PTO grant for the materials that we would need. Each group spent time creating a list of things that they would "need to know". Their lists included things like: the type of fish we would need, where to put the tanks, how to create a healthy habitat for the fish and plants, and cost of materials. They knew they couldn't go above $150 for the PTO grant. Throughout the research process, students use a standard set of graphic organizers that go along with the Big6 process. They relied heavily on books that I had ordered about aquaponics, videos and articles from databases. As research progress, through weekly conferencing it became obvious that all of the groups were really getting hung on the type of fish we could use in the system and creating a healthy habitat, while missing some of the critical ideas about where we were going to put the systems. Each week I heard the kids discussing things like the ability to raise tilapia or trout, and the need to create a comforting environment for the well being of the fish. While they were on topic, they weren't exactly on focus. I found myself gently questioning them about daily research goals and if they were making progress towards those goals. They would shrug and say maybe not - and try to refocus. 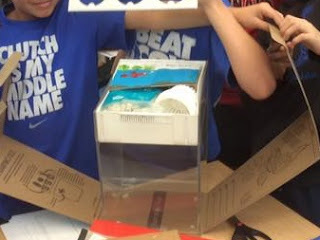 The original plans that the kids designed for the 55 gallon tank included two tanks that would utilize a flood and drain system, similiar to what our smaller kit was going to do. 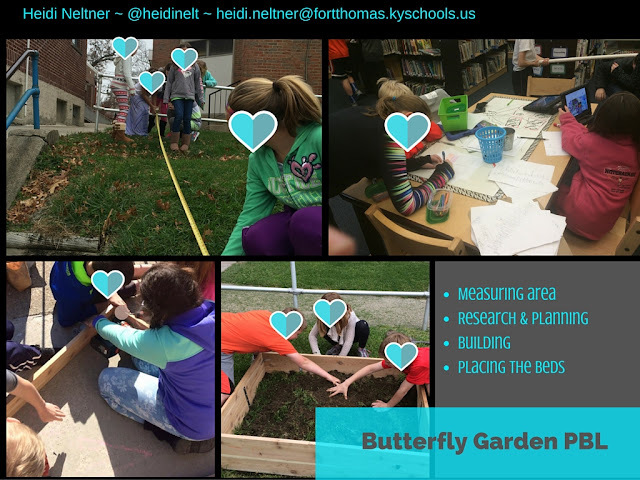 After having a long hard discussion with the kids about space concerns for a system like this and with no obvious locations, we reached out to a University of Kentucky expert who was working with us on the Butterfly Garden project. He suggested using a float and grow approach. After some searching around, the kids were convinced it could work, and they gave me an idea of what we would need. I took their suggestions and headed out to Worms Way ,a local aquaponics store, and the good folks out there helped me fill in the blanks on what we would need. With the materials ordered, we decided that the best place to put the 55 gallon tank would be on the circulation desk. The circulation desk is huge, has electric and could hold the weight of the tank and water. I put the tank into place for the kids and we were set to tackle the issue of filling it when we noticed something pretty important. It doesn't sit flat on the desk! There are decorative ridges in the desk that create an uneven surface. The kids were under the impression that we should just try to fill it and see what happens, so I asked the kids what they thought would happen if we filled the tank like it was. "What will the tank weigh with water in it?" I asked them. They looked up the average weight of a gallon of water and realized that the tank would weigh just under 500 pounds. It became obvious to them that the weight alone would likely crack the tank and send water all over the library. As groups, they began to look for alternative locations again, but by this time it was so late in the year I knew it was time to talk to them about scaling back the project. As I was talking to them about how I thought we might have to save the 55 gallon tank for next year when they were in 5th grade, once we had time to sort out a solution to leveling my desk, I looked up on top of the bookshelf and saw an old fishbowl that has been there for quite a while and had an idea. "What if," I asked them "we used that fishbowl to prototype what you might do with the a larger tank. 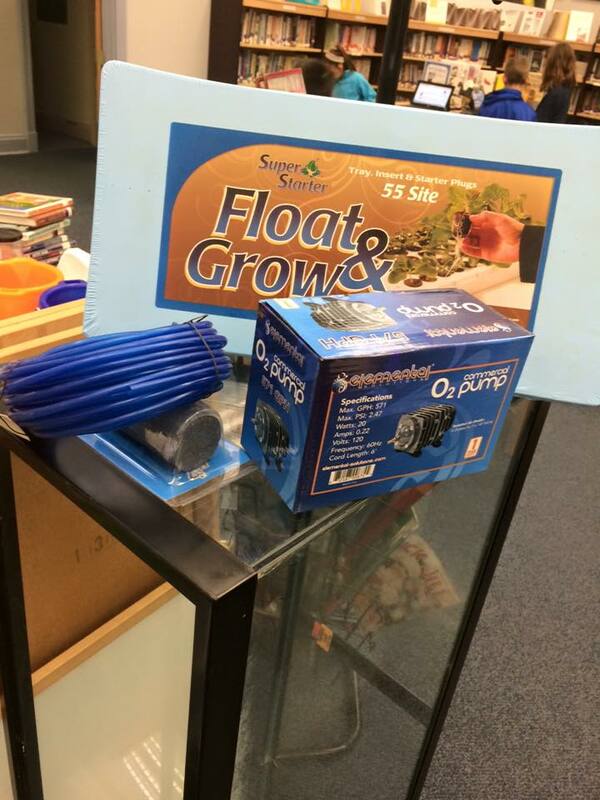 Let's see if a float and grow system works using something much smaller." The kids, although disappointed, rallied quickly and figured out that with a styrofoam ring and a small plant basket they could mimic the float and grow tray we had purchased. 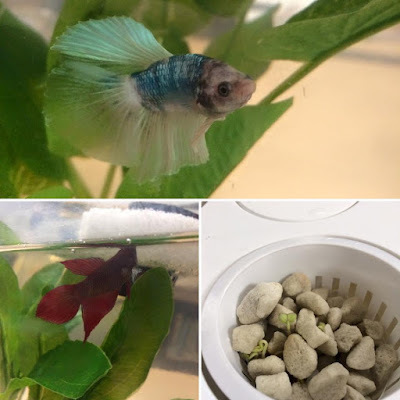 On the same day, the kids assembled the two different systems that we had, and the next day I went and bought two Betta fish for them to release into their systems. On student direction, I also purchased some fake plants since they were very concerned about the Bettas having a place to hide so they would feel comfortable in their new habitat. Both of the systems worked beautifully. In the kit we purchased we grew wheat grass and radish sprouts and in the float and grow prototype system, the kids started a sunflower that we could transplant outdoors. In the picture on the right, you can see the red Betta fish under the styrofoam float and grow prototype. After the teachers began to take notice of some the things that have been happening in the library with PBL, I was able to talk tot he 5th grade science teacher about the possibility of using the 55 gallon tank for an aquaponics/ Trout in the Classroom type project. With what we have all managed to learn, about setting up a system, and after talking to the kids to gauge their interest, it certainly seems like a possibility. I plan to touch based with the 5th grade teacher at the beginning of school year and then work to follow up on some expert leads I've been given. After seeing the difficulties we had with this project, I think one of the big takeaways I had was that we may have been much more successful had I sought out expert advice much sooner and maybe even partnered with a community organization to make it work. Overall, I feel like we did hit the engineering standards in a natural way, and the kids for sure got some great lessons in research that I wanted. When I debriefed with the kids on what their biggest takeaways were, they shared that they because they got too swept away with tank design and over the top fish research, they missed some opportunities to troubleshoot problems sooner. They seriously wondered if they would have stuck to the research questions each week, if the 55 gallon tank would have come together. In our discussion I was able to reassure them that sometimes we find a thread that sparks our curiosity and we can't help pursuing it, and that's ok, but sometimes there are consequences to that. It was a very real lesson on how to keep track of self-directed research, and I hope it's one they remember. 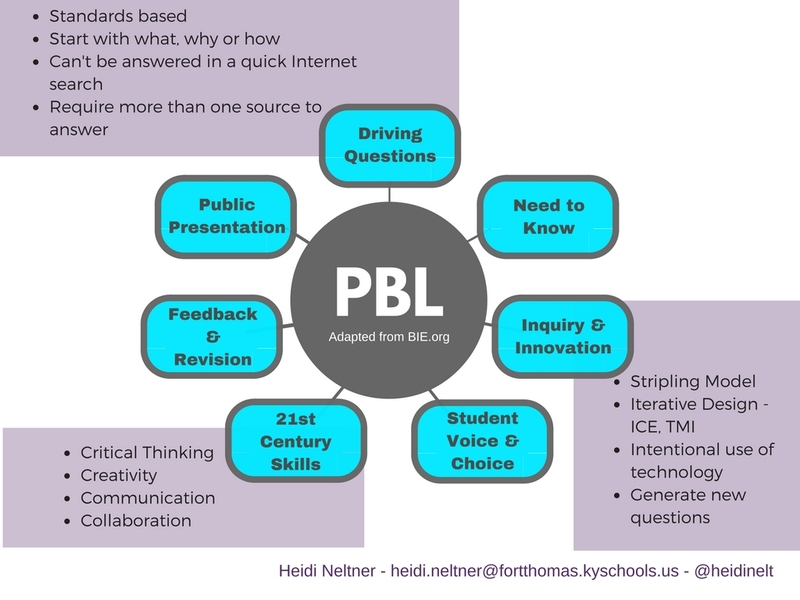 For the last few years I've been working to develop a makerspace in the library and a model of Project Based Learning that works for me and my elementary students in the library - a model that I can use to convince classroom teachers to take the leap into PBL with me. At the conclusion of this year, I think I've finally got a good recipe for success, and teachers, having seen the outcomes, are up for collaborating. Projects in the library take a million times longer than in the regular classroom because I only see the kids once a week for 45 minutes, so what might take the classroom teacher 2 weeks to coach students through, takes me an entire semester. But, without a doubt, these projects turn into meaningful conversations about content across disciplines and extended inquiry. For the course of the 2015-2016 school year, students in 4th grade were focusing on developing strong research skills. At the end of their third grade year, students self assessed themselves on a number of research skills using a rubric I had created. I looked at that data over the summer, and found that many of the kids self-reported difficulty with questioning skills, note taking strategies and identifying source information. During conferences over the summer with the 4th grade teacher team, I shared those results and the idea that I would like to use one of those areas to work on developing for my Student Growth Goal (SGG). Once the year began, I had students self-evaluate their skills based on a fourth grade research rubric, and compared their perception data to the end of the third grade year. After some deliberating and discussion with the 4th grade teachers, I decided to focus on questioning strategies. Throughout the course of the year and through different research projects, students worked on developing good research questions as part of the Big6 research model. Students wrote questions for Wax Museum biography projects, feature articles and quick activities during library. I assessed them for growth on a question rubric I developed and found that by mid year most students had achieved proficiency. As a final project to demonstrate proficiency in writing quality research questions, I challenged students to write a research question that would guide them through the process of researching a topic that would align with NGSS Standard 3-5 ETS1-1 “Define a simple design problem reflecting a need or a want that includes specified criteria for success and constraints on materials, time or cost. 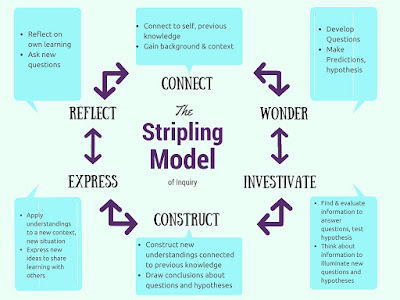 Before we even begin PBL, students have been introduced to, and have a good understanding of the Big6 Model of Research and they've worked with our makerspace format that allows for more independence and choice in project design. To set students up for success I have implemented a set of standard graphic organizers that we use that go along with the steps of either the Super 3 or Big 6 methods of research, and I have those organizers available for student self service in a research center in the library. All graphic organizers that students would need to be successful throughout the inquiry process are available here, labeled in folders for students to come in and get when needed. Students even pop in the library regularly to get handouts they need for projects they are doing in the classroom. We use the Big6 model of research with a research guide - The Big6 Research Planner- that I have worked to develop and revise over the years. Even though the kids by 4th grade are familiar with the Big6, we always review using a video I made a few years back. 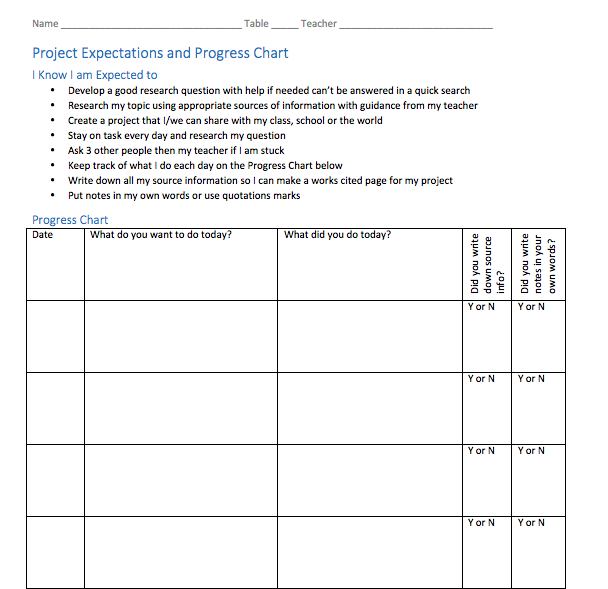 The planning guide featured in the video, has been revised, but it provides me with natural "milestones" for student check ins and conferences, and because we use it for all research projects, even those done in the classroom, by middle of the year in fourth grade, the kids can use it with very little direction. Big6 Research Planner - students check in after Step 1, Step 2, throughout Step 3 as needed, and for conference on Synthesis in Step 5. Prior to the project launch, I also do a little bit of research to try to find books I may need to order for the library collection and I look for a few helpful websites students may have trouble finding on their own. This year I started to use Padletas a way to share resources with students. I like this approach because it is so easy to add and delete resources. The kids also like it because if they find a resource that they think would help groups in other classes, they can add to the resource bank, thus increasing collaboration across classes. Many of the groups this year requested their own padlet pages to use to organizer their own resources. This is something I would for sure continue in the future. I wish I could say that I had some awesome entry event for the project, but instead I relied on the students being excited for the choice. This year, I gave students the choice between four general projects. It was up to them to create a driving question for it. Choice 1: Build a Raised Bed Garden One of our Spanish teachers had approached me the previous year to ask about collaborating on a butterfly garden to help preserve monarchs. We had made some community connections and with the wonderful direction of the University of Kentucky Campbell County Cooperative Extension Office we had managed to secure a grant to make that happen. For this project students would need to plan the garden and tell us what we would need to do to build it. Choice 2: Assemble an Aquaponics System My brother needed to unload a 55 gallon fish tank, he usually just leaves this kind of stuff at my house and I find whatever he needed to off load after he's gone. I had been reading quite a bit about aquaponics in schools and this seemed like an excellent way to try it out. For this project students would need to design an aquaponics system, tell me what we would need to purchase and propose the design so that we could start plants in doors for the butterfly garden. Choice 3: Fix our Raspberry Pi so that it would Tweet This was a continuation of our project based learning experience from last year that failed because of a mistake I made. For this project the kids would have to troubleshoot the tweeting program or rewrite it an entirely to get it working. Choice 4: Prototype a Google Cardboard This one came about because I had been so excited to learn about Google Cardboard during the summer, and I really wanted to give the kids a chance to make one on their own. For this project studnets were to study it and see if they could figure out a better material. I ordered lenses for them to use. When they saw these choices, the kids were pumped! It didn't take much on my part to introduce things. They were ready to run with it right away. Approved questions went on the Big 6 planner and students began working the research process, pausing to conference after steps and discussing search terms and appropriate sources. To help manage the middle, I circulated through the groups a lot, checking their source material and making sure they were writing in their own words and double checking to make sure they were still researching their driving question using approved search terms. I kept checklists to make sure I was sitting down with groups regularly. To help manage work, we had a timeline written on the library door (it's painted with clear dry erase paint), and students kept a progress chart. Progress chart has students develop a daily goal and write down whether or not they accomplished it. As we conferenced I was able to have students refer to their progress charts and I was able to use their Big6 Research Planner as a point of discussion. For these projects, since library is not a grade, I asked students to assess their own progress in research using a Research Self Reflection. For a project extension I also had students create a documentary of their learning. I used the documentary as an assessment tool to make sure that the kids could share the big ideas that they had learned and reflect on their learning. They combined still images, video clips they made throughout the process and voice overs in iMovie. These skills will come in handy next year. The process of doing the documentary was a nice writing extension. The kids did a decent job writing their storyboards and creating the documentaries - although it was a little hard for me to convince them that the storyboard became the documentary. There was a disconnect there, that maybe would not have been had we not been rushed at the end of the year. Check back for to the blog for discussions about how the individual projects went. Once I have those posts up, I'll be sure to update this post with links. Ultimately, students made a lot of decisions in the process of what they were doing and I gave them the freedom to do that. Hopefully some of the projects developed this year will continue into next so that we can have a chance to extend learning in ways the kids want. 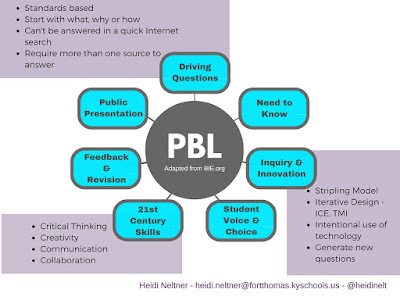 Hove over the image below for links to books and online resources you may find helpful in setting up a makerspace to aid in project development for PBL and Genius Hour, or see the image at Thinglink. When it comes to planning for and creating a makerspace in your library there is a lot to consider, beginning with the needs of your school community, budget and space concerns. 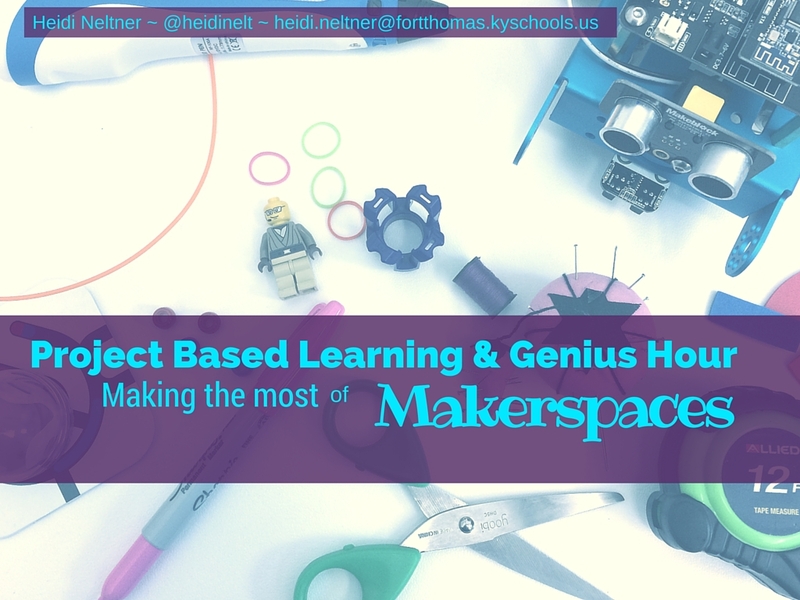 At the KLA/KASL 2015 Joint Conference I'll be sharing my experience with creating a makerspace on a budget. 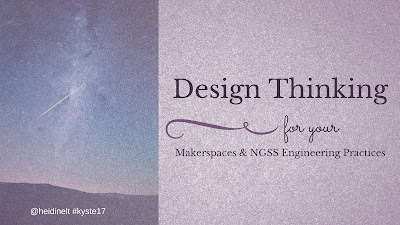 Below you will find my slide show, and some suggested items that you might want to use as a starting point for stocking your makerspace. Be sure to check out KyMakes as a resource for sharing and curating ideas, especially those that are standards related, and for exploring a Symbaloo of maker related links and resources. Hover over the handout below to see links to some of my favorite resources and items. The list of items here is a really just for reference - it's not the perfect list, there's no such thing really - but it may get you thinking. I did include links to items you might want to check into as a point of reference, but I would for sure shop around for the best deals. It's best to think of this list as a resource versus a shopping list of things you have to get. Some of the items here may work for you and many you may find no need for. They're just some things that have worked well for my students.